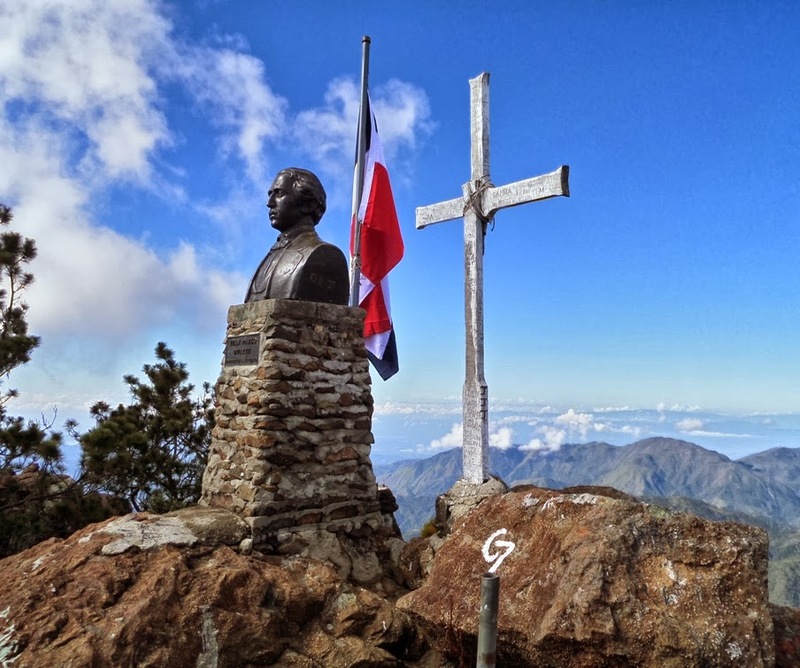 Moshe Shmuel Cohen stood on the summit of Pico Duarte in the moonlight in front of the Dominican flag, the bust of Duarte and the “Christian symbol.” He had spent the day in a burrow well off the trail, concealed from light and curious eyes. “You were not here my prior visit and are not so formidable as the Goyishe hunters believe.” He laughed bitterly. “I was last here after Kristalnacht lamenting for my people, but how dare I pray to Hashem as I am? Hitler was a greater evil than I but there is an older evil seeking me. They are Van Helsing now but were Venandi when I was young. I’ll feed in La Ciénaga later, but soon I’ll need allies. I wrote this for the What Pegman Saw writing challenge. The idea is to take a Google maps street image and location and use it as the inspiration for crafting a piece of flash fiction no more than 150 words long. My word count is 150. Today, the Pegman takes us to the summit of Pico Duarte in the Dominican Republic. I really, really didn’t plan on writing yet another vampire story, but every other approach I could think of fell apart, particularly due to the fact that the name of the summit and the objects located there weren’t present before about 1961. However, I did discover that a small population of Jews did settle on the island before and during World War Two, so I decided to involve my Jewish vampire as well. I introduced Moshe Cohen in the story The Shadow Meeting which was part of my original Sean Becker series. That series stalled and so I relaunched it with The Beginning of the Fall. The most recent story is They Will Run You Down In The Dark. A modern organization of vampire hunters currently calls themselves The Van Helsings, but in Na Gauna Ni Tevoro, I revealed their original name as “The Holy Order of Venandi,” “Venandi” meaning “hunter” in Latin. I’ve been struggling to find a way to reintroduce Moshe into the current Sean Becker universe and, seeing a bit of Jewish history on the island, decided to have him originally visit their and climb the summit in or around 1938. Oh, I found out that the most likely place to begin the hike and ascent of Pico Duarte is from La Ciénaga. By the way, I did find an article about the history of Jewish belief in vampires. Your vampire is quite the character! Captures his POV beautifully. I could completely see him drowsing in his burrow for the day. No 24 hour bed and breakfasts available on the hike up the mountain, I’m afraid. Thanks. Now that’s something I’ve never come across… a Jewish vampire! Since I’ve created a Christian vampire, why not Jewish. It begs the question of what happens to a deeply religious person who becomes the undead. Do they abandon their former beliefs or are the held torturously suspended between their longing for God and the evil of their vampiric nature? Why not indeed? It does beg the question. After reading all of Anne Rice’s books, I don’t remember religion being part or not of them… Now I’m curious! I think I read her “Interview” book decades ago but must confess to not remembering anything about them. I’m hesitant to read such books now because I’m afraid they’d influence me too much and I’d end up emulating the “canon” and style. I adored them… well at least the first 4 or 5. Stopped my “vampire stage” at that point. Do you really think they would do that to you? I’m not sure Dale, but I don’t want to find out. I read the article in your link to Haaretz, and it appears to me that most of the very few writings it cites are about other superstitions besides vampires. However, it does *not* surprise me that Jewish writers at different times may have borrowed their neighbors’ superstitions in order to try their hand at writing some horror fiction. The Frankenstein monster of Mary Shelly is said to owe its inspiration to the medieval Jewish tales of the Golum which was a somewhat zombie-like character. And since eating blood is not kosher, a vampire would make an admirably-horrible villain to Jewish sensibilities. Considering the blood-libels against Jews throughout history, however, I would expect that Jewish literary dabbling in such themes would be deemed exceptionally dangerous, to the individual writers and to the Jewish community as a whole, and therefore strongly discouraged. While the aversion to the Christian symbol of a cross is a common theme in vampire lore, a Jewish vampire would have even more reason for such aversion. A very real problem for Jews, then, in cultures where such a superstition is common, however, would be that any such aversion would become a justification for the ignorant to suspect vampirism rather than other reasons for antipathy toward Christianity. Consequently I’m strongly tempted to request that you dispose of your Jewish vampire as quickly as possible, be done with him, and not make any more like him. As a Jewish character, his own self-loathing would likely motivate him to prefer to seek self-immolation and purification in the strongest desert sunlight at the earliest opportunity. I would think that the requirement to drink blood would make a Jewish vampire a very tortured creature, and thus very interesting. I hadn’t considered your take on a Jewish vampire being even more repulsed by the cross since my understanding of how a cross or crucifix functions is that it repels the undead because it is an object reflecting the holiness of God. I’ve mentioned in other comments involving vampire that I find how the various cultures treat this sort of being interesting and just about every human culture has some legend that resembles a vampire to one degree or another. Especially given what you’ve said, I’m not sure what to do with Moshe now. We’ll see. I’m sure you realize that the notion of a cross as an object supposedly reflecting the holiness of God is a parochial Christian one. To a Jewish mindset it would be quite the opposite, and aversion to it is a quite normal Jewish response to the history of Christian persecution and supersession, quite apart from the superstitious lore about vampires. It is precisely because of such confusion among people whose worldview is Christian or post-Christian that I respond so strongly against feeding that confusion with tales of a Jewish vampire. Considering that the classic medieval blood-libel was that Jews kidnapped Christian children to mix their blood into the making of Passover matza, thus already equating them with vampires, a Jewish vampire with any residual sense of responsibility for his fellow Jews would do his best to remove himself from adding any contribution to that libel and its threat to the existence of the Jewish community. Thereby the suicide which I suggested previously would be an exceptional likelihood. He would wish, if possible, to foster a notion that it is impossible for a Jew to exist as a vampire — but at the very least he would do everything possible to prevent his Jewish identity from being discovered by a vampire hunter. Hence, self-immolation in a remote location is a logical course for him to choose. That’s certainly an interesting thought and I hadn’t considered that at all, PL. I like this character. I did a comic about a vampire who didn’t know he was a vampire, having been bitten when he was in his early seventies. He worked night shift jobs and lived alone, but was often driven by insatiable urges he couldn’t understand. Each chapter of the comic was set in a different time period, but the old man was always the same. I guess I see every vampire as a tragedy. I like the idea of having an eternal being POV of history. I remember reading a horror magazine in the 1970s and in one story, a woman suspected her husband was a vampire. In the end she discovered she was the vampire and that he had been procuring blood for her which he put in her nightly drinks. He was protecting her but I think she ended up having a stake driven through his heart. This vampire of your is quite eloquent. I like him. Thanks but as my friend PL points out, he probably would hate himself. I found your tale in response to the prompt quite fitting. Thank you! I know it’s popular lately to portray vampires with a fine-tuned moralistic sense. Thus vampires who loathe themselves. This became popular, I think, with Anne Rice’s Lucien in the Interview with a Vampire series. It’s an interesting idea, but I’m not sold on it. I realize that an exhaustive examination of Jewish beliefs toward blood could make a Jewish vampire’s activities especially heinous to the Jewish Vampire. However, I feel that the current trend has led us away from what truly makes a vampire, and a delicate sense of morality ain’t it. The original story of Vlad tells us that after his beloved committed suicide Vlad was filled with a rage and an all-consuming hatred of God. This is what made him a vampire, NOT a continuing commitment to God and his teachings. A vampire derives it’s powers from its hatred of God. To continue to be religious with all the sensibilities of a religious person would make a vampire, not a vampire. It would be a corpse instead, inert, powerless. Vampire’s cannot truly be Christian or Jewish or anything else. By definition, they aren’t religious at all. When a lion kills a baby antelope it doesn’t question the morals of what its done. We humans happily eat our quarter-pounders and chicken nuggets blissfully chewing without a single thought about the death of the animal we eat. Predators don’t moralize about their food. They just eat it. Likewise, vampires don’t moralize about their blood-letting. Vampire’s don’t have morals, derived from religious beliefs. They see the lives they snuff out as their just due, their kick in the teeth in the face of God. Destroying one of God’s creations would hardly make the most anti-God creature possible sad, it would probably be the only thing that makes them happy. So, for me, I think your vampire story is perfectly valid, and as I said, I find him quite interesting. This makes my Sean Becker vampire series somewhat problematic then. I’ve depicted Becker as a flawed Christian struggling with many temptations. The last and most lethal was his affair with the vampire Dolgren who eventually ended his human existence so that he rose again as a vampire. However, he’s not a mindless beast. None of the vampires are. He is a creature of darkness but he remembers the light, at least enough to where he grieves its loss. He’s rather manic-depressive. Before and during the hunt, all he can think about it the blood, the chase, the feeding. Afterward, he’s afraid and sorrowful at the wretch he’s become and totally baffled as to why God would abandon him to this. I’ve hinted that he was under a curse even before his transition and that there’s more to his becoming a vampire than simply being bitten. I find the moral ambiguity compelling. If he just rejects God and becomes totally evil, then he’s not interesting at all. Killing him would be the natural outcome of the story, but that’s so ordinary. What if there’s a terrible struggle in each of these creatures. True, some and perhaps most succumb to the evil and let themselves be swept away, but what if others resist. What is groups of them band together to resist falling completely into the abyss? Also, let’s stay there’s an ancient Catholic order of vampire hunters who continue to exist in the modern age, a group of religious fanatics bent of driving evil from the Earth, but who are also willing to employ the same methods as the evil they propose to battle, including torture and even murdering the innocent to slay the guilty? I’ve done some Googling about Jewish vampires and blood libel (turns out I’m not the only one to write about a Jewish vampire) and it’s actually pretty racist to cast a Jew in that role relative to what Jews have been historically accused of, so for now, I’ll hold off writing anything more about Moshe Cohen. I do agree the concept is compelling, but if I continue his existence, I’ll need to do so in a way that makes some sort of sense and also clearly communicates that he is not the poster child for the anti-Semites. I’m about to publish a story set during the ten plagues of Egypt (Moses, Aaron, Pharaoh). Now what would an ancient vampire do with a literal river of blood? Well my thoughts on vampires are not the most common. Anne Rice’s vampire was certainly popular, and even I happily read four or five of the books. Her main character, effeminate and whiny as I felt he was, was still compelling enough to keep reading. I think morally ambiguous characters are always interesting. The anti-hero is always popular for this reason. I agree that a vampire character who dives headlong into evil is just boring. I think the thing that I dislike is a character who moans and groans about his condition and never moves on. I only have so much patience for the “Tortured Soul.” That’s just me. Others love it. “Blade” was also a tortured soul, but he did something with his abilities. He took vengeance out on vampires. Now that’s an interesting character for me. So a vampire with a moral dilemma, an internal struggle, is fine, and interesting to me, as long as he doesn’t spend the whole story moping about it. Vampires have fantastic abilities. Why not use them? What if this Becker truly did believe (rightly or wrongly) God had cursed him? What if he felt he could use these abilities to atone for his sins and convince God to remove the curse? That might be further complicated if these Van Helsings always spoiled his efforts. In the same vein, what if your Jewish Vampire used his abilities for good? That might take the sting out of how a Jewish Vampire is perceived. What he worked with the Mossad to hunt down former Nazis? That’s a detail the Mossad wouldn’t want anyone to know about, but the incredible senses of a vampire would be an asset they’d be unlikely to ignore. Then there’s Neo-Nazis and other anti-semitic groups. I would a enjoy a story where somebody takes those as***les down. Actually, I had thought about a vampire who hunted Nazis and it certainly be interesting. Fun fact: the movie character “Blade” was based loosely on a character in the “Dracula” comic books from the 1970s. In the comics he was a full vampire and a former private detective who hunted other (evil) vampires. I read your story about an Egyptian vampire enjoying the plague that turned Egyptian waters into blood. The unanswered question is whether a vampire can ever get enough blood to be truly satiated, or if it is possible for one to become uncomfortably overstuffed from too much, or to drown in the stuff, or if one could become inebriated, pass out (hence the possibility of drowning), suffer delirium tremens hallucinations or withdrawal symptoms afterward when the supply was reduced again to meager proportions. I’ve been thinking yet more about some uncomfortable parallels between vampire characteristics and medieval views of, and accusations against, Jews. Three key characteristics of vampires are the consumption of blood, possibly to the degree of murder, the aversion to the fundamental Christian symbol of the cross, and the need to operate in darkness and to hide from daylight. I’ve mentioned above the anti-Jewish blood-libel accusations and the aversion to crosses and crucifixes due to centuries of unrelenting Christian persecution. I could add to that the view that Jews are secretive and unknowable and that they hide themselves from ordinary (i.e., gentile) society. Hence, they are metaphorically hidden from the “open light of the prevailing culture”. I can see how that metaphor could be turned to an image of hiding from the light and being constrained to darkness. Now, there is another characteristic often cited about vampires having no reflection in a mirror. I’m not sure if I can think of any analog for this in medieval Christian views about Jews, but finding three out of four characteristic analogs makes me wonder if vampire lore has been founded on a corruption of ancient anti-Semitism, or perhaps elaborated from it, or if it could have been the other way ’round with anti-Semitism having drawn notions from vampire lore, or if there is some other sort of Jungian connection between them regarding “the accursed stranger”, or “the other”. You mentioned some Google research (which I have not tried to do, yet). Did you find this sort of analysis, or perhaps something a bit more rigorous and detailed? I appreciate your willingness to put Moshe Cohen out of sight for now (back into the crypt, I suppose). I don’t know if there is any redeeming value that might be pursued in dealing with such a character, unless perhaps it would be to expose the connections above and have the character simply evaporate into the nothingness of the unreality of which he was envisioned, as the light of understanding would un-create him. A Jewish vampire? Oy vey. Yes, my friend in Israel has already expressed his discomfort and I find his argument compelling. Vampires are a commonly running mythological thread across religions and cultures. That said, your Jewish Vampire is super cool. Thanks, Lavanya. However as PL said, the character could be made to serve the “blood libel” stereotype and myth that has long been used against the Jewish people, so I’m going to tread carefully here. Hmmm. Well great job on the different take anyway. Wow! What a lot of research, thought and debate about vampires! Good story, James. Thanks, Penny. From what I can tell of authors I admire, good research can make the difference between a good and a great story. I’ve been called on my lack of research before and admittedly, for these short stories, I probably don’t put in all that much effort compared to longer tales. Wow. What story, James. Wow what comments and conversations you have provoked. As a writer, your job is done. I find it fascinating learning people’s points of views. This has been fascinating story. Well done for showing the courage to write it, and post it. Thanks, Kelvin. Funny what can be spawned from just a few hundred words. One of the big issues is that my wife and children are Jewish so I certainly want to avoid writing anything that would continue the historic hate against the Jewish people, Lynn. Thanks. It’s a tricky balance, I can see that. Sometimes fiction can stray into dark waters. Actually last night I read an article about the ethics of fiction writing posted on another blog. Some authors have even gotten into legal problems crossing certain lines. It could be very possible to write a piece of fiction that would upset or insult a person or group of people. I took that sort of risk when I wrote The Last Festival. Fiction is sometimes used to comment on real people or real circumstances and it can be taken too far. I’m glad you added some explanation as there was a lot in there. I’m not sure if I want him hunted down or if I want him to find his allies and remain safe from the hunters! Right now I’m suspending the character for reasons explained in other comments. He might have a future but I suspect it will be a grim one.